Has your husband ever been discouraged? Of course he has! Let’s be honest for a second. Few things leave us wives feeling more helpless than when we can’t find the words to encourage our husbands with when they are feeling discouraged. Or what about when you DO have the words, but the encouragement doesn’t work? Both parties are discouraged and nothing changes; attitudes and outlooks don’t get any better. What do we do then? How do we encourage our husbands when we can’t find the words or when our attempt at encouraging him doesn’t work? Stop using your own words and use God’s Word! 1. God’s Word is sharper than any two-edged sword. When you encourage your husband with God’s Word it doesn’t just go into his head, it pierces down into his heart, soul, and spirit. We can’t forget that, often times, when we see discouragement on the outside, it can be a spiritual battle on the inside that neither of you may know is even taking place. This is one of the reasons encouraging with scripture is so powerful: it encourages your husband on multiple levels. 2. God’s Word will ALWAYS accomplish what it is supposed to. Have you ever tried to encourage your husband and it feels like it goes in one ear and out the other? You try so hard to say something that will lift his spirit and encourage his heart, but it seems like it flies right over his head! This is absolutely impossible with God’s Word. Isaiah 55:11 says “...so shall My word be that goes out from My mouth; it shall not return to Me empty, but it shall accomplish that which I purpose, and shall succeed in the thing for which I sent it.” When you encourage your husband using God’s Word, you can be sure that it WILL ACCOMPLISH something in his heart, mind, soul, and spirit. This is a promise! 3. You will always reap what you sow. Every single time you encourage your husband, you are planting seeds. Seeds for a future harvest. In the moment, we want to see that seed immediately produce a harvest of encouragement in our husbands. Galatians 6:7 says, “Do not be deceived: God is not mocked, for whatever one sows, that will he also reap.” When you sow scripture into your husbands, it’s setting him up for a future harvest that has MUCH MORE than just temporary encouragement. I want to encourage any of you ladies who have been doing this already and have yet to see a change in your man. Keep going. Don’t give up. Remember, God’s Word will not return void and will always accomplish what it is set out to do. Just because you haven’t seen it working yet doesn't mean it’s not doing something. So what scriptures are you supposed to encourage your husband with in different situations? 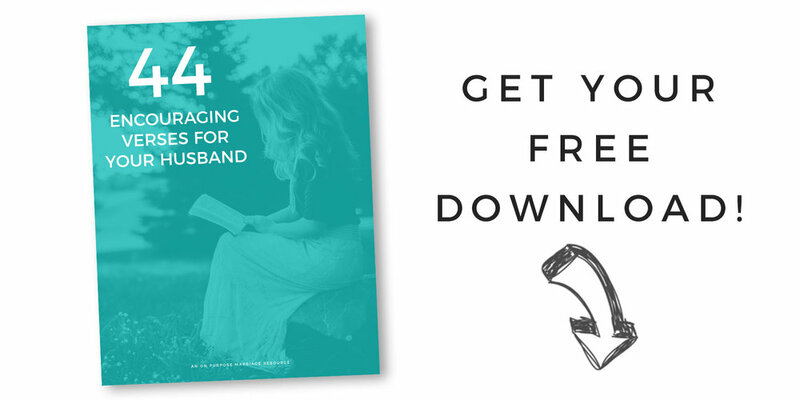 I’ve created a free download called “44 Encouraging Verses For Your Husband”. In this free download, I’ve separated verses out into different categories so you’ll have a scripture for just about any situation. I’ll be updating this list periodically, so when I add more verses or categories for encouragement in the future, I’ll be sure to let you know. To get the download, just put your info in below so I know where to send it!